Lawnchair Is Out Of Beta, First Stable Build Released - AndroGuider | One Stop For The Techy You! Lawnchair is a highly customizable launcher which is based on the launcher found in Pixel smartphones. The first beta build of Lawnchair was released on XDA forums a year ago. 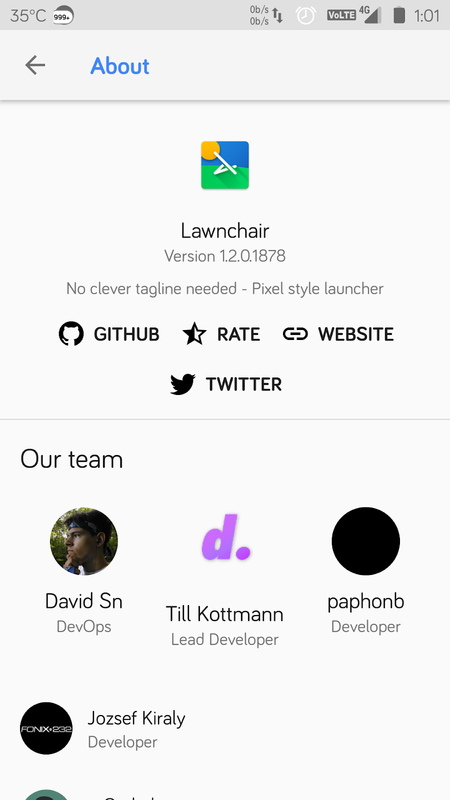 Shortly after that, a beta program was launched on the Play Store, and now after seven months of testing, the first stable build of Lawnchair is up for grabs. The v1 of Lawnchair is stable and includes final Oreo support, a new 'About' section in Settings, and bug fixes. The team behind Lawnchair has started working on the next release of the launcher, and the first alpha build of v2 is already available. To test out the v2 alpha, you can join the Telegram group of Lawnchair by clicking here. The public beta testing of v2 will start in about two weeks. If you were enrolled in the beta program, you will be receiving the stable update. Alternatively, you can also update by installing the APK from here. Now that Lawnchair is available as a stable release on the Play Store, you can also rate it.